"Terebithia" redirects here. It is not to be confused with Terebinthia. Bridge to Terabithia is a work of children's literature about two lonely children who create a magical forest kingdom in their imaginations. It was written by Katherine Paterson and was published in 1977 by Thomas Crowell. In 1978, it won the Newbery Medal. Paterson drew inspiration for the novel from a real event that occurred in August 1974 when her son's friend was struck dead by lightning. The novel tells the story of fifth grader Jesse Aarons, who becomes friends with his new neighbor, Leslie Burke, after he loses a footrace to her at school. She is a smart, talented, outgoing tomboy from a wealthy family, and he thinks highly of her. He is an artistic boy from a poorer family who, in the beginning, is fearful, angry, and depressed. After meeting Leslie, his life is transformed. He becomes courageous and learns to let go of his frustration. They create a kingdom for themselves, which Leslie names "Terabithia." The novel's content has been the frequent target of censors and appears at number eight on the American Library Association list of the 100 Most Frequently Challenged Books for the decade 1990–2000. It is studied in English studies classes in Australia, Canada, Ireland, New Zealand, the United Kingdom, and the United States. It has been adapted for the screen twice: a 1985 PBS TV movie and a 2007 Disney/Walden Media feature film. Katherine Paterson lived for a time in Takoma Park, Maryland, a suburb of Washington, D.C.. The novel was inspired by a tragedy of that time: on August 14, 1974, her son David's best friend, Lisa Christina Hill, died after being struck by lightning in Bethany Beach, Delaware. She was eight years old. There is a tree dedicated to her in a memorial outside Takoma Park Elementary School (pre-K to second grade), which she and David attended. Sligo Creek, which runs through Takoma Park, may have provided inspiration, too. I thought I had made it up. Then, rereading The Voyage of the Dawn Treader by C. S. Lewis, I realized that I had probably gotten it from the island of Terebinthia in that book. However, Lewis probably got that name from the Terebinth tree in the Bible, so both of us pinched from somewhere else, probably unconsciously. The novel makes a direct reference to The Chronicles of Narnia as a series of books that Leslie lends to Jess so he can learn to behave like a king. The novel also indirectly alludes to the fantasy series The Chronicles of Prydain. In the novel "Bridge to Terabithia," Paterson illustrates the life of an artistic young boy named Jess Aarons and the burdens and hardships of his home life, such as his duties on his family's farm and the constant agitations and annoyances of his four sisters. He has straw-colored hair and long legs. Leslie Burke is an intelligent, wealthy girl who has just moved into "the old Perkins place" down the road from him. He is initially cold toward her. After having trained all summer to become his class's fastest runner, he is infuriated when she outruns him in a recess footrace. After further negative experiences with classroom tormentors or rivals, including Gary Fulcher, Jess eagerly anticipates the arrival of music class due to his infatuation for its beautiful young teacher, Miss Edmunds. However, on the day it begins, he discovers a fondness for Leslie, eccentric and ostracized, and they develop a friendship. He marvels at the way she genuinely likes to read and write, not just to impress their teacher, and the way she makes running look beautiful and effortless (not that he would ever actually say anything of the sort). On a sunny day, Jess and Leslie use a rope to swing over a creek, and they decide to design an imaginary sanctuary from the burdens and pains of everyday life. They reign as monarchs, calling their domain Terabithia and constructing a small refuge in which their imaginary escapades take place. At school, Jess and Leslie are challenged by an older bully named Janice Avery, whom they immensely detest. After she steals a package of Twinkies from Jess' younger sister May Belle's lunch, they forge a romantic letter under the disguise of Willard Hughes, the object of Janice's infatuation, setting her up for misunderstanding. The plan is successful, exposing her to public mortification. Later, Leslie encounters her sobbing in the girls' bathroom. It develops that her father beats her severely, and that this explains her difficulty relating to other people. She is upset since she had confided her troubles to her two best friends, and they have spread the rumor all throughout the school. At this, both Jess and Leslie develop sympathy and even the beginnings of a friendship with Janice. In the meantime, Leslie's bond with Jess also increases powerfully, and they continue to indulge in the pleasures derived from Terabithia, adopting a puppy named Prince Terrien, abbreviated to P.T. One day in Terabithia, Jess complains about going to church for Easter and Leslie asks if she can come. He is uncertain about her request and he asks his mother about it. She reluctantly agrees and off they go. After the mass, Leslie inquires what happens if you don't believe in God. May Belle jumps in and claims that He will damn you to hell. They looked at her in shock and Jess tells her to not go around damning people to hell. On being invited on a trip to an art museum with Miss Edmunds, Jess accepts the offer without notifying Leslie or his parents beforehand (he tells his mother while she is half asleep). He enjoys it, but upon returning home is horrified to learn that while he was away, Leslie attempted to visit Terabithia on her own and drowned in the creek when the rope broke. A shocked Jess, incapable of absorbing or accepting the impact or horror of her sudden death, denies his grief and even her existence. It is implied that May Belle is terrified that Leslie may be sentenced to eternal damnation due to her doubts regarding religion (revealed at Easter). Jess's father reassures him that God could not possibly be so unfair. After he miserably accepts the inevitability of Leslie's death, he is saddened even further by the grief exhibited by her mourning parents, who have decided to return to their previous home in Pennsylvania. Jess decides to pay tribute to Leslie by crafting a funeral wreath, bending a pine bough into a circle. Leaving it in their special pine grove in Terabithia, he discovers a terrified May Belle halfway across the creek—having attempted to follow him over the fallen tree he used to get to Terabithia after the rope broke—and assists her back. The Burkes grant him some lumber (from aborted renovations) they are leaving behind, which he uses to build a more permanent, though rudimentary, bridge. He chooses to fill the void left by Leslie's death by making May Belle the new queen of Terabithia, permitting her to share his sanctuary which had been Jess and Leslie's secret. Then, he tells her to keep her "mind wide open" and all of the inhabitants of Terabithia welcome their new queen. Leslie Burke — An intelligent, talented, imaginative, outgoing girl, it is she who creates the imaginary kingdom of Terabithia. Her talents include gymnastics, creative writing, swimming and running. Jess thinks highly of her, and they are loyal friends. She is a newcomer to his school, and not socially accepted by the other students. She dies when she falls into a creek and sustains a head injury that keeps her unconscious until she drowns. Joyce Ann Aarons — Jess' bratty baby sister. May Belle thinks she is "nothing but a baby". May Belle Aarons — One of Jess' younger sisters. She is described as the only one of his siblings with whom he feels comfortable. However, because she is six years to his 10, she does not fit the mold of the ideal confidante to him, leaving him still desperate for companionship. She clearly worships him from the beginning, and like him, feels that she does not have a place in the family. She is the first of his sisters to learn about Terabithia, and becomes the queen after Leslie's death. She is the only one he allows to enter his world and the only one who has any sort of empathy for, or acceptance of, him in his family. Ellie and Brenda Aarons — Jess' two older sisters. They primarily exist as secondary static characters, or ones who do not grow or change as a result of the events of a story. They are never mentioned separately within the novel and are never portrayed in a positive light. From the beginning, they continually ask for favors from their mother, and pocket money which she cannot afford to give them. With sufficient whining, they know how to get their way with their parents, such as asking for five dollars to pay for school supplies from their mother by saying that their father promised that they could have the money. Being the older of the two and the oldest child in the family, Ellie develops their ideas. Both have an incredible desire not to have anything to do with Jesse specifically, but with all of their younger siblings more broadly. At the climax of the story, when Jess learns of Leslie's death, Brenda is the one who tells him of it. The fact that she is the one who breaks the news to him in the novel only serves to increase the shock. Janice Avery — The school bully at Lark Creek. She is very overweight and tends to become very offended when people tease her for being so. She has a crush on Willard Hughes, which Jess and Leslie use to trick her. Her father beats her and she secretly smokes. Also, her face is used on the giant troll living in Terabithia for the 2007 movie. Miss Edmunds — The somewhat unconventional and controversial music teacher, whom Jess greatly admires. She invites him to go to the Smithsonian Museum, which leads Leslie to go to Terabithia by herself. As a result, she is alone when she falls from the rope and drowns. Prince Terrien — A puppy that Jesse gave Leslie for Christmas. He is the guardian and court jester of Terabithia. In the novel, he is referred to as P.T. Gary Fulcher — He and Jess both hope to be the fastest kid in the fifth grade; he serves as another bully in the story, but he is not quite as mean as Janice Avery. Mrs. Myers — Jess and Leslie's teacher, given the nickname "Monster Mouth Myers." She favors Leslie, and tells Jess after her death that she was the best student she had ever had. Her husband had also died. Bill and Judy Burke — Leslie's parents, novelists who come to the story's location for their work. Mom — book writer, Dad — political writer. Unlike most of the locals, they do not watch television. The novel's content has been the frequent target of censors. It ranks number 8 on the American Library Association list of most commonly challenged books in the United States for 1990–1999. On the ALA list for 2000–2009 it ranks #28. The challenges stem from death being a part of the plot; Jesse's frequent use of the word "lord" outside of prayer; allegations that it promotes secular humanism, New Age religion, occultism, and Satanism; and for use of offensive language. The novel is often featured in English studies classes in Ireland, Singapore, Australia, New Zealand, Canada, the Philippines, Ecuador, the United Kingdom, Costa Rica, Panama, South Africa and the United States. In 2012, the novel was ranked number ten among all-time best children's novels in a survey published by School Library Journal, a monthly with primarily U.S. audience. Two other books by Paterson made the top 100. Two films have been made based on the novel, both with the original title. One was a PBS TV movie made in 1985, starring Annette O'Toole, Julian Coutts, and Julie Beaulieu. The second was a theatrical film released on February 16, 2007, directed by the co-creator of Nickelodeon's Rugrats Gabor Csupo and starring Josh Hutcherson, AnnaSophia Robb, Robert Patrick, Bailee Madison, and Zooey Deschanel; the adaptation was done in part by David Paterson himself. 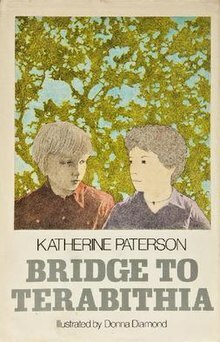 A musical stage adaptation ("supported by a lyrical score") entitled The Bridge to Terabithia is listed for sale by Stageplays.com, credited to Paterson and Stephanie S. Tolan, another children's writer. It was catalogued by the Library of Congress in 1993, with primary credit to Steve Liebman for the music, as Bridge to Terabithia: a play with music (New York: S. French, c1992). ^ admin (1999-11-30). "Newbery Medal and Honor Books, 1922-Present". Association for Library Service to Children (ALSC). Retrieved 2018-12-24. ^ a b "100 most frequently challenged books: 1990–1999". Office for Intellectual Freedom, American Library Association (ALA.org). 2001. Retrieved 2015-01-14. ^ a b c Kohn, Diana (2004). "Lisa Hill and the Bridge to Terabithia". Takoma-Silver Spring Voice. Archived from the original on June 14, 2009. Retrieved 2007-02-14. ^ "Questions". Katherine Paterson (terabithia.com). Retrieved 2007-02-08. ^ "Questions for Katherine Paterson". Bridge to Terabithia, 2005 Harper Trophy edition. ^ Paterson, Katherine; Diamond, Donna. Bridge to Terabithia Movie Tie-in Edition. HarperEntertainment. ISBN 0-06-122728-5. The last sentence of the novel, "Shhh, yes. There's a rumor going around that the beautiful girl arriving today might be the queen they've been waiting for." ^ "Top 100 Banned/Challenged Books: 2000-2009". American Library Association. Retrieved 2015-01-14. ^ The National Council of English Teachers curriculum report including section "Why Bridge To Terabithia Should Not Be Banned" which discusses the death issue. Archived Archived January 27, 2007, at the Wayback Machine 2007-01-27. Retrieved 2007-02-08. ^ "Opinion: What Have Other People Thought About Bridge to Terabithia?" Archived December 29, 2009, at the Wayback Machine. Scholastic Kids (scholastic.com/kids). Retrieved 2007-02-08. ^ "Connecticut Residents Seek to Ban Two Newbery Medal Winners from School" Archived February 21, 2007, at the Wayback Machine. American Booksellers Association. Retrieved 2007-02-08. ^ Annotated list from "Ten Most Challenged Books of 2002" Archived 2010-10-26 at the Wayback Machine. ALA. Retrieved 2009-09-07. ^ Grade 5 Reading List. British Columbia Ministry of Education. Retrieved 2007-02-08. ^ "Year 9 curriculum" Archived September 26, 2007, at the Wayback Machine. National Strategy Literacy and Learning in Religious Education. Retrieved 2007-02-08. ^ Bird, Elizabeth (July 7, 2012). "Top 100 Chapter Book Poll Results". A Fuse #8 Production. Blog. School Library Journal (blog.schoollibraryjournal.com). Archived from the original on 2012-07-13. Retrieved 2015-10-30. ^ "The Bridge to Terabithia: Katherine Paterson & Stephanie S. Tolan". Distributor product display. Stageplays.com: Largest Collection of Plays and Musicals in the World. Retrieved 2014-08-16. ^ Subject (LCSH) "Musicals—Librettos". "Bridge to Terabithia: a play with music"[permanent dead link]. Library of Congress Online Catalog. LCCN Permalink (lccn.loc.gov). Retrieved 2015-10-31. This page was last edited on 14 April 2019, at 22:00 (UTC).